For the 20th consecutive year, the Labrador retriever is the most popular purebred dog in America. There's a reason why Labs are the most popular purebreed in America. 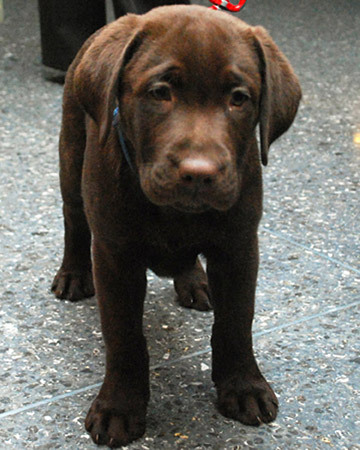 The Labrador retriever thrives as part of an active family or as a trusted hunting companion. A double-coated breed, Labs sheds seasonally and require regular grooming to keep their coat at its water-resistant best. Because of their even temperament and trainability, Labrador retrievers are owned as pets by millions of Americans. When it comes to "portable" dogs, Yorkies are the breed of choice. They are easily adaptable to all surroundings, travel well, and make suitable pets for many homes. Due to their small size, they require limited exercise, but need daily interaction with their people. Their long coat requires regular brushing. Beagles are happy-go-lucky and friendly, making them a wonderful family pet. They are also favored for their compact size and short, easy-to-care-for coat. Since they lived in packs for hundreds of years, they naturally enjoy the company of other dogs and humans. Curious and comedic, they often follow their noses -- which can lead to some mischief if they are not provided with daily activity. Dachshunds are lovable, playful companions, and an ideal pet for many homes, including those with children with appropriate supervision. They require moderate exercise and can adapt to most living environments. Depending on their coat type, Dachshunds may need regular grooming. As the sole purpose of the Shih Tzu is to be a companion and house pet, he should be lively, alert, friendly, and trusting toward all. He requires minimal exercise, but his long, luxurious coat needs daily brushing and maintenance.